Joseph Denaro illustrator -- a/k/a Joe Denaro fashion illustrator. AboutFace J Denaro LLC is a new premium clothing brand featuring Joe Denaro's “beauty heads” fashion art on quality tees. 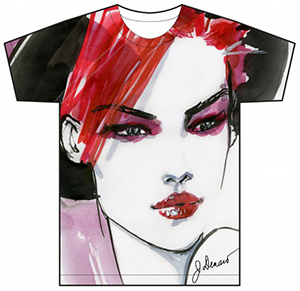 His beautiful fashion illustrations are now availabe on his designer line of “exclusive tees, ” created with the same passion as his art. Click to http://www.aboutfacejdenaro.com to order your fashion tees. Parsons, The New School for Design (Fashion Design). Copyright © 2009 by Joseph Denaro. without permission of the artist.